It’s an iconic and powerful photo. 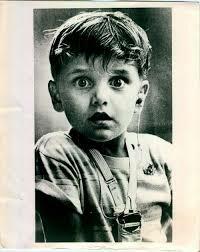 The face of a young child, born deaf, hearing sounds for the first time. Jack Bradley, photojournalist from the Peoria Journal Star, captured the exact moment a doctor fitted five year old Harold Whittles with an earpiece and turned on the hearing aid. First printed in the February 1974 issue of Readers’ Digest, the photo has propped up in numerous “best-of” lists on the Internet. It is “shocking,” “miraculous,” “unbelievable,” “influential,” “heartbreaking,” “heart-warming,” “amazing,” and “evocative.” It has been circulated thousands of times on Facebook, where commentators have expressed their thoughts: the photo brings tears, it serves as a reminder of our humanity, it tells people to “count their blessings,” it resonates to personal experiences with deafness and hearing, and it triggers debates about language, culture, and technological achievements. For many individuals, the photo immortalizes more than Harold’s astonishment. It serves as a testament of the wonders of medicine and science, the abundance of hope, and provides us with a glimpse into the future. Bradley’s photo is only one in a long list of sensationalized stories on deaf people hearing sounds. A search through YouTube lists about 72,800 results for videos on “hearing sound for the first time.” At least once a month, someone sends me a link to a new video, or to a post discussing the novelty of sharing stories like this. I may not remember exactly what it was like when I first heard sounds again after losing my hearing, but I have a problem with the way these videos are promoted: they sensationalized the notion that hearing could be “switched on.” This is a misleading claim. Implants, whether they are cochlear, auditory, or the newer brainstem versions do not restore “normal” hearing but makes it easier for deaf individuals to distinguish sounds. It’s not like wearing these technologies miraculously provide the wearer an understanding of all the sounds in the world. I’ve had friends who’ve been fitted with cochlear implants describe how overwhelming the sound were, and how certain everyday noises, like wind hitting the trees or leaky faucets, created so much confusion. * Cochlear implants in particular, create a representation of sounds that serves to assist in understanding speech; because of this, speech can sound robotic, or filtered as if everyone was speaking underwater. I wear digital hearing aids and even I have trouble distinguishing certain noises or even pinpointing the source of sounds. Once, while out dining with friends, I watched a restaurant worker remove the external part of her cochlear implant nearly every time she went behind the counter. But when she went towards the dining room to seat customers or bus tables, she had the device on. I imagine the cacophonic atmosphere of the dining room might have overwhelmed her–I know for me, it was so loud I ended up leaving the restaurant with a throbbing headache (I’m very sensitive to loud sounds, which often trigger migraines). But for me, the larger problem with these videos is that they depict deafness as a defect, a problem that must be corrected, medically, surgically, technologically, and even culturally. This is a perspective that has long been criticized by members of the Deaf community, who argue these devices are another instance of the historical oppression of Deaf culture and a tremendous threat against sign-language. I’m not going to go too much into this. There’s plenty of literature on the subject. I don’t identify myself as a member of the Deaf community and I do write about the medicalization of deafness, but I try to be sensitive to balancing the perspectives of both hearing and Deaf culture–even if at times, it’s so challenging to do so. *This point reminds me of one of my favourite philosophical thought experiments: If Mary was born and raised in a black-and-white room and never seen color, but one day, is allowed to go outside, does Mary understand, or have any concept of, the color red?